In 2010 a large earthquake struck Haiti, its location is shown by the yellow star. More than 200,000 people died in the capital city Port au Prince and the surrounding area. 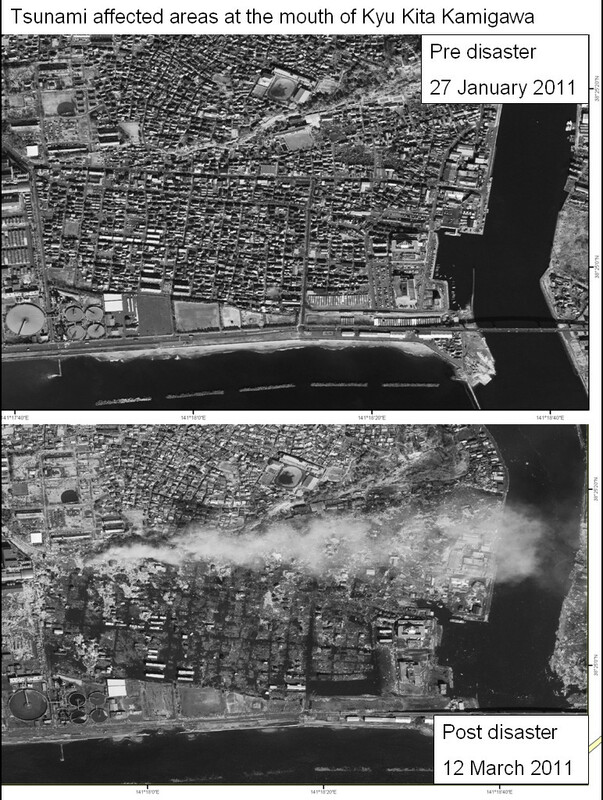 Here are two interferograms created from satellite images taken before and after the Haiti earthquake. The arrows show the direction the satellites were travelling in and the angle they took the images at. The difference between the images taken before and after the earthquake allow us to measure the displacement caused the earthquake at the earth's surface. Each cycle of colour from pink to red represents ~11cm of movement and if you add them up like contours on a map you get the total amount of movement at the surface caused by the earthquake, in this case 80cm. We can use these measurements to work out where exactly the earthquake occurred and why it is was so large. Natural disasters such as earthquakes, hurricanes and floods can happen just about anywhere on Earth, as can man-made disasters such as explosions and oil spills. Because some incidents can cause damage to roads and telephone lines, and often over large areas, it can be very difficult to find out what is going on in the disaster area. Disaster Monitoring Satellites can help with this – and there is a group of dedicated satellites that do this called the Disaster Monitoring Constellation (DMC). Most of the time, each satellite works for the country that owns it, but their images can be used by anyone if there is a disaster. There is usually at least one satellite looking down on the right place. The detailed pictures taken by DMC satellites give governments and emergency workers information about what is happening on the ground to ensure food, aid and equipment are sent to the places that are in need. Movie 'fly through' of The Afar Depression. The theory of plate tectonics is widely accepted and there is reasonable agreement as to how it works. However, because the break-up of the continental crust and the generation of new oceanic crust occurs on a geological timescale, how this actually happens and what processes are involved is still poorly understood. The recent rifting episode and eruption in the Afar region offers a unique opportunity to study this transition from continental break-up to seafloor spreading, to document and to model the geological processes and to determine how the crust grows at divergent plate boundaries. During the Afar Rift project we aim to track the creation of magma (molten rock) from deep within the Earth, studying how it migrates and evolves as it rises towards the surface. We will study how the surface of the Earth reacts as it is thinned and split apart and how the magma is intruded into this thin crust to form the beginnings of a new ocean. Can you spot the difference? El Niño is an event that happens roughly every 4 years that drastically changes the ocean, causing phytoplankton numbers to decrease. This has a big impact on other ocean life because phytoplankton are at the bottom of the marine food web. Close up of a Coccolithophore (also called coccolithophorid) a single-celled alga. Phytoplankton are the base of the marine food web. This means that all the animals that live in the ocean rely on phytoplankton for food. 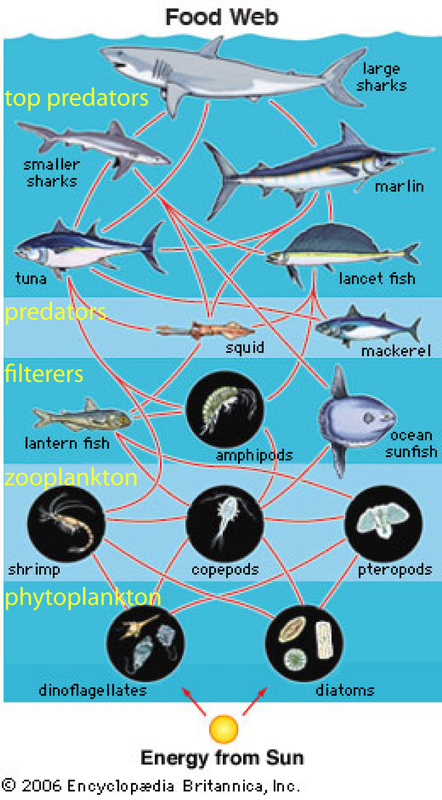 You can see in this example food web that even animals that don’t eat phytoplankton themselves, eat animals that eat animals that DO eat phytoplankton! 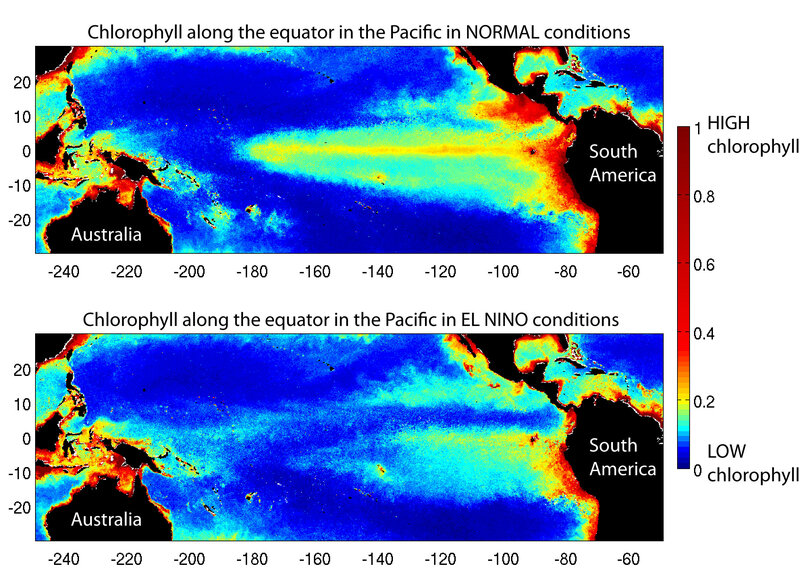 The amount of phytoplankton in any one place in the ocean changes with the seasons. Around the UK, a big increase in phytoplankton numbers happens in April. Just like on land, the plants in the ocean are bursting back into life as spring arrives. 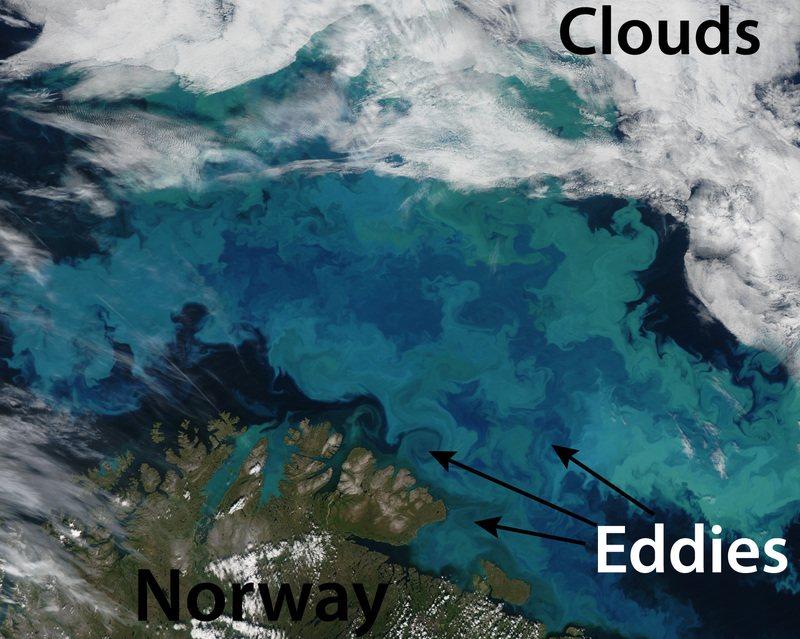 Why do all these swirls and eddies appear in the phytoplankton image? (Use button below). Because phytoplankton can’t swim! The movement of water in the ocean controls where phytoplankton can grow. 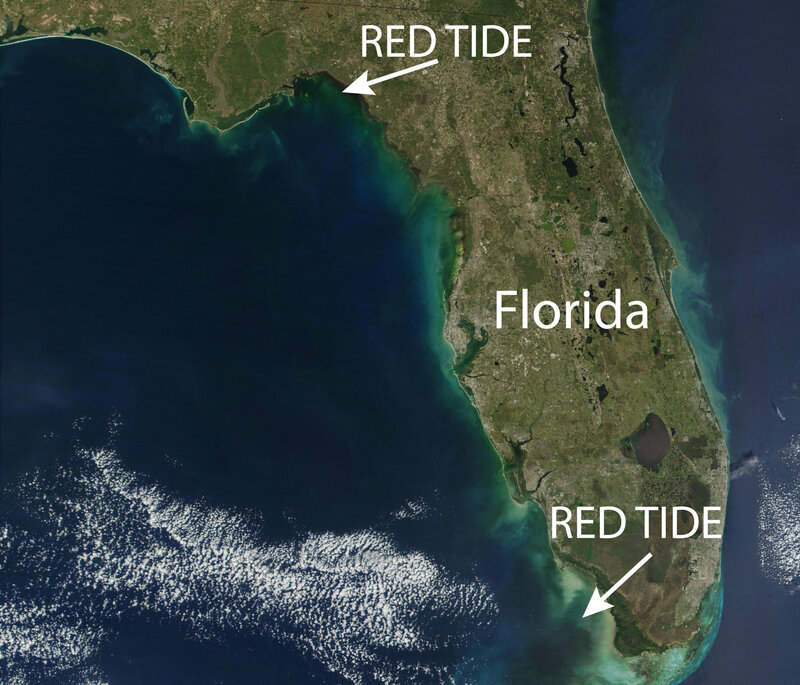 The dark patches of water in this image are red tides – massive blooms of toxic phytoplankton that can kill fish and poison humans. Most phytoplankton aren’t toxic though and are very important for making Earth a comfortable place for us to live. Phytoplankton are plants, so they absorb carbon dioxide from the air and release oxygen. In fact, almost half of the oxygen we breathe is made by phytoplankton! 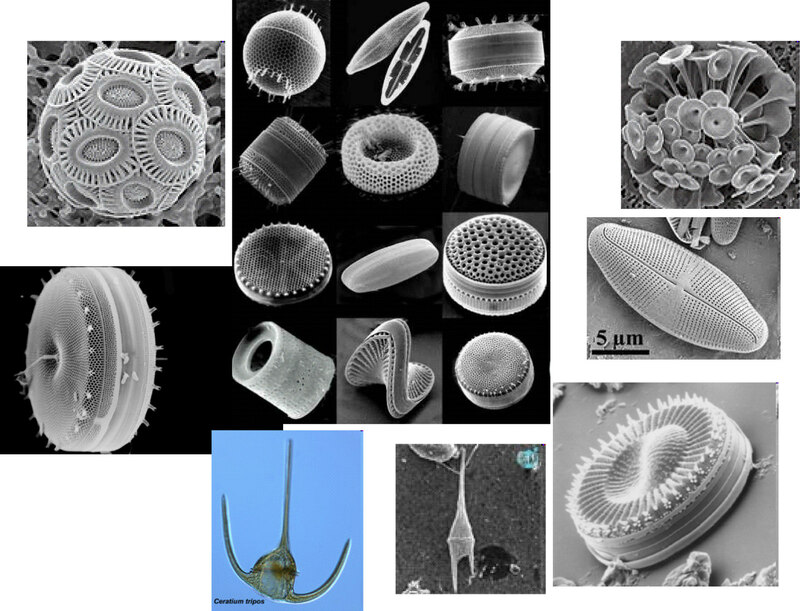 There are at least 5,000 different types of phytoplankton! They come in many different shapes and sizes, and under a microscope we can see their beautiful designs. A very small number form dangerous 'red tides', but the majority have important jobs keeping our climate comfortable and feeding the ocean’s marine life. 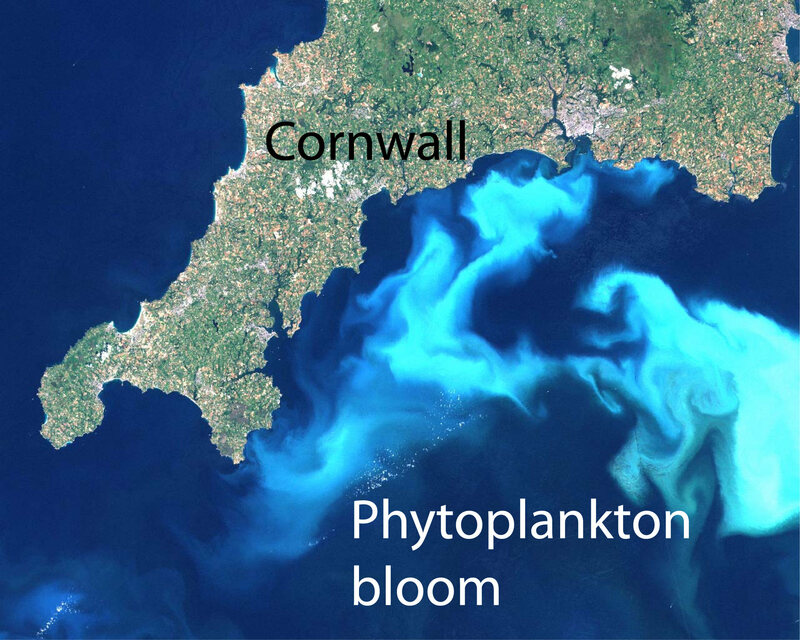 When spring arrives the plants of the ocean (phytoplankton) start to bloom – just like the flowers and trees on land. 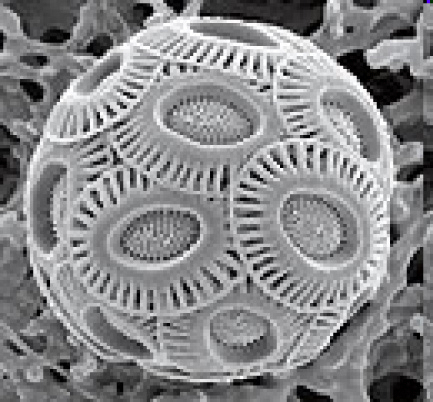 This image shows a bloom of ‘coccolithophores’, one of many different types of phytoplankton. An individual phytoplankton is too small to see with the naked eye, but they are so many of them in the ocean that we can see them from space! All phytoplankton, like all plants on land, contain chlorophyll which make them green. So the more phytoplankton there are, the more chlorophyll there is, and the greener the water. 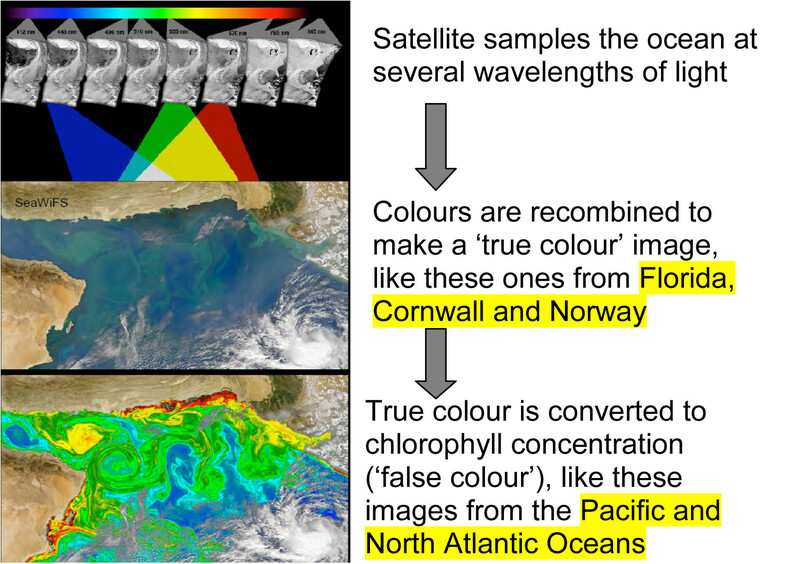 Satellites can sense these changes in ocean colour and translate them into chlorophyll concentration. This is an image of a small event in the Eureka Valley, California in May 1993 This is an overview map to give an idea of the area that one interferogram can cover, in this case nearly 100 sq kilometres. It is possible to zoom in to see more detail. 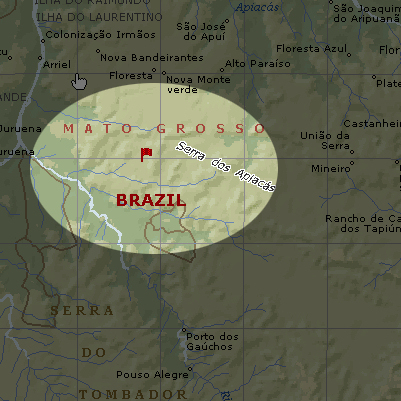 This is next to the Indio Maiz Biosphere Reserve, showing deforestation both next to and inside the reserve, as well as some active reforestation projects. 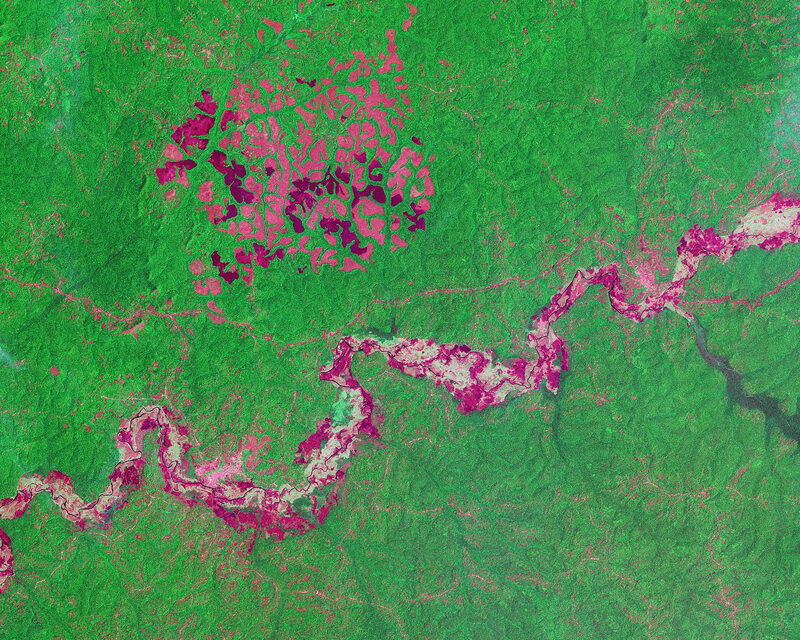 The purple patches around the roads are deforestation, green areas are tropical forest. There are also non-forest areas around the Dja river (flowing left to right), and there's a patch of natural remnant savanna in the top left of the image. The different colours show the differences in surface water temperatures in the waters around the Balearic Islands. Sea temperature is important to monitoring and understand climate change. 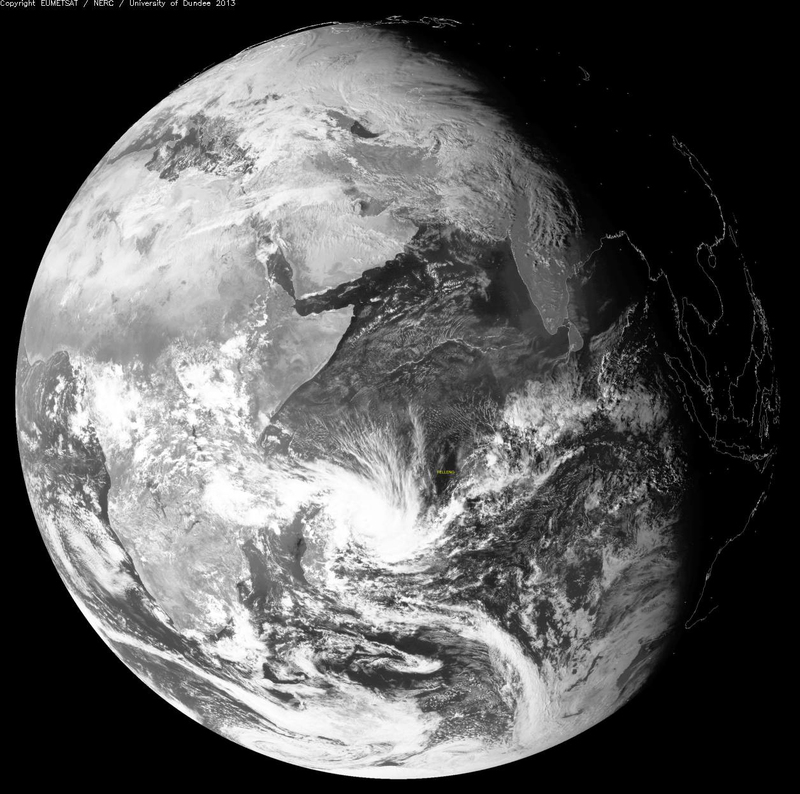 Captured by Envisat's Advanced Along Track Scanning Radiometer (AATSR) using visible and infrared channels. This information helps climate researchers better understand the role of oceans in our biosphere. With the future of forests a global concern, sustainable management practices are increasingly urgent. 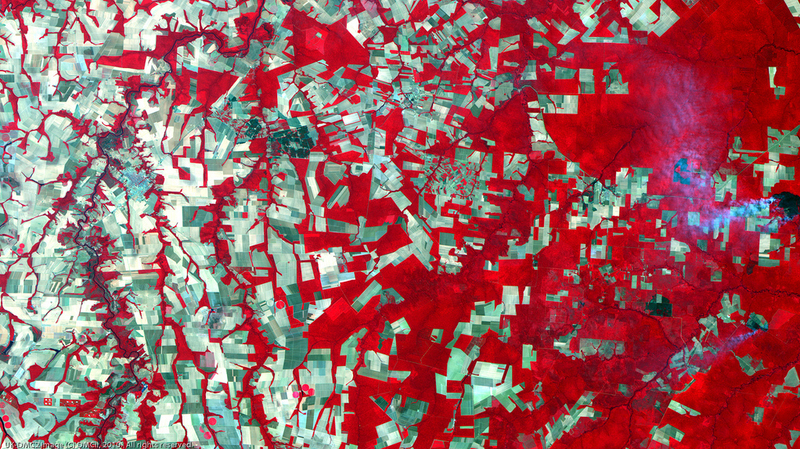 Satellites supply accurate, timely and readily available information on the state of this precious resource. 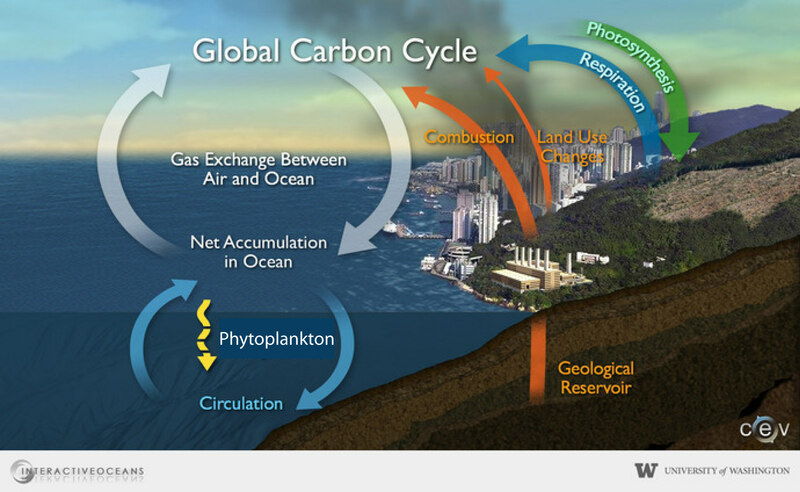 Ozone gas forms a layer in the atmosphere. It absorbs the harmful ultraviolet components of sunlight, protecting living things. Above the Antarctic there is a man made hole which allows these rays through. The hole has been monitored via satellite since it was discovered and the chemicals that damaged the layer are now banned. In 2012 the ozone hole was much smaller and lasted a shorter time than in 2011. Ozone loss over the South Pole is displayed at the bottom (the bold dark line indicates the ozone loss for 2012 and the grey line for 2011). On 13th February 2013 the tropical island of Madagascar was hit by Cyclone Giovanna. The storm caused power cuts and several landslides. 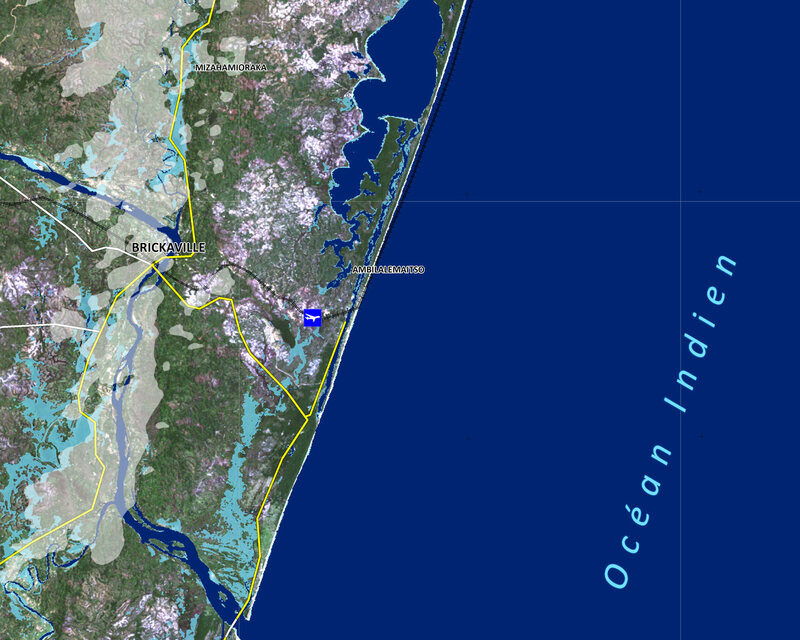 The light blue areas show flooding extent shortly after the cyclone struck compared to the dark blue extent in 2011. The white and yellow lines show transport links in the region. Rescue workers can use maps like this to find out which areas need help and the best route to get to affected areas. This image was captured by UK-DMC which, supplies images of disaster zones to help with rescue operations under the International Disaster Charter. We already know from satellite records that the area covered by the Arctic sea ice has been declining, particularly in summer. The past six years have seen the lowest summer ice extent in three decades, reaching the lowest last September at about 3.61 million sq km. The data from the CryoSat mission in this animation has shown that this has also been accompanied by a large decline in ice volume. 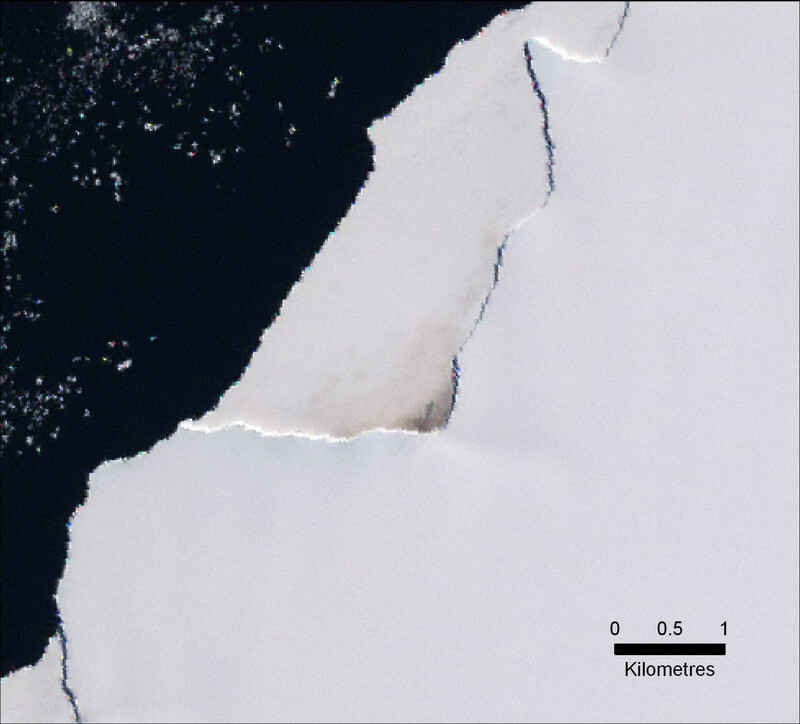 Estimates of the sea-ice volume for 2010-11 and 2011-12 using data from ESA’s CryoSat satellite. Winter variations in the sea ice thickness for 2010-2011. CryoSat’s altimeter makes precise measurements of its height above the ice by measuring the time interval between transmission and reception of very short radar pulses. Christchurch, New Zealand was hit by a powerful 6.3 magnitude earthquake on 22nd February 2011. In total 185 people died. Many buildings were damaged particularly around the central city and eastern suburbs. 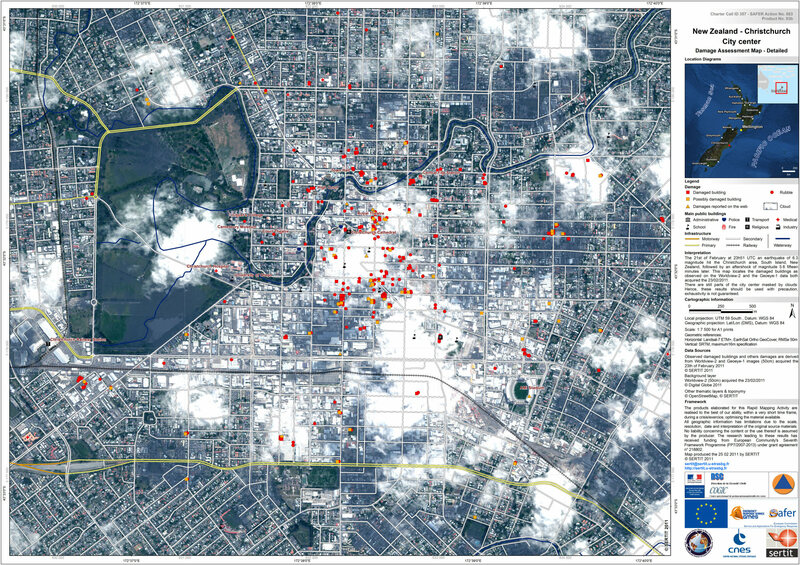 This map locates the damaged buildings observed one day after the earthquake struck. It was produced to be used in the rescue and clean up operation. Not all building will be damaged in an earthquake - it depends on how a building has been built and the rock type underneath. On March 11 2011 an 8.9 magnitude Earthquake hit north-east of Japan causing extensive damage, triggering a tsunami. Can you identify the damage caused by comparing the top image taken in January 2011 and the bottom image taken shortly after the earthquake struck? A sandstorm obscures the border zone between Pakistan and India's Thar desert. Wind-driven sandstorms rising in the Thar are a common feature of the harsh January to June dry season. South of the desert state of Rajasthan is the booming coastal state of Gujarat, in this image, much greener. Gujarat is one of the most industrialised and fastest growing states in the country. Further west along the coast is the salt marsh known as the Rann of Kutch, once a shallow section of the Arabian Sea until it was cut off by geological uplift. Each wet season its salty clay and mudflats are filled with water, serving as breeding grounds for birds. 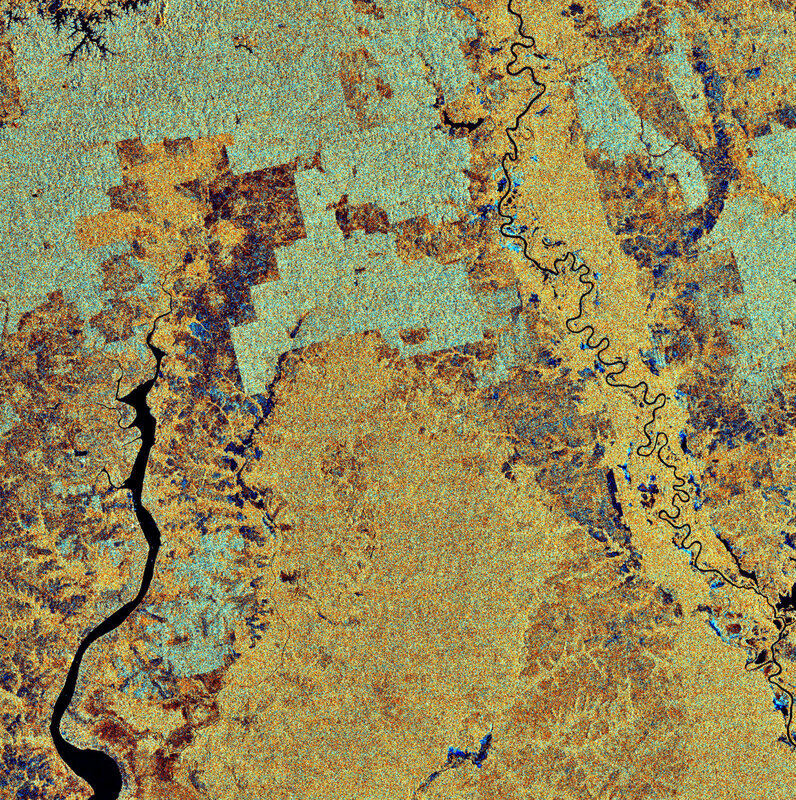 This false colour image from the UK-DMCii satellite shows how farmland has replaced rainforest in the Amazon river basin. The red areas show the virgin forest, largely on the right hand side of this image and in corridors along the rivers and tributaries. The cultivated areas are clearly spreading from the green patches of agriculture out into the rainforest. How do we measure deforestation? From the ground? You would need a lot of people and a lot of time to measure deforestation from the ground. It can be very difficult, especially in the more remote areas. From the air? You can see a wider area in a plane but as the name ‘rainforest’ suggests there is often a lot of cloud cover, making it difficult to see. From space? Satellites see a much wider area from orbit. Some instruments on satellites don’t use visible light. This means they can capture forest cover when it is cloudy and even at night! 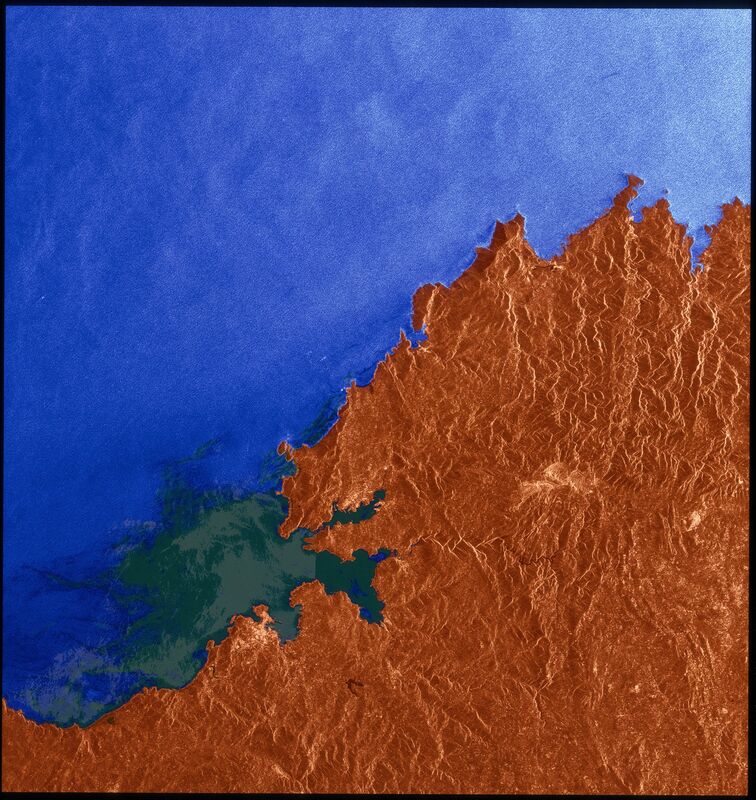 This radar Envisat acquisition highlights Indonesia’s Kalimantan region in the southern part of tropical Borneo in South East Asia. Borneo, the world’s third largest island, was once covered in dense rainforests. In the 1980s and 1990s these forests were cleared for their timber at an alarming rate. 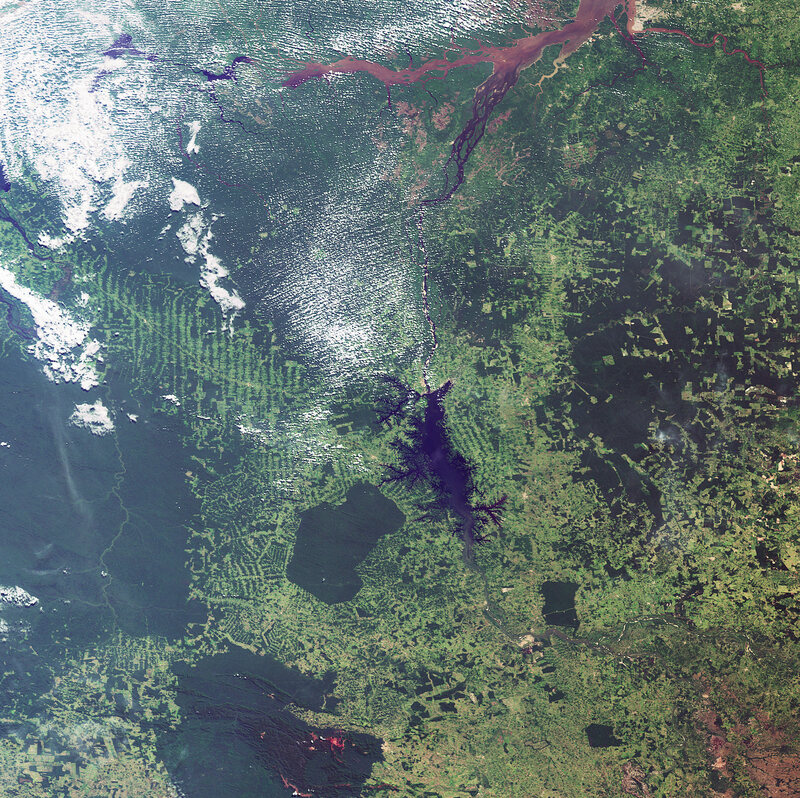 Soon after, the global demand for palm oil increased and what was left of Borneo’s forests started being cleared for palm plantations (visible as square green patches). Is this deforestation, or reforestation? 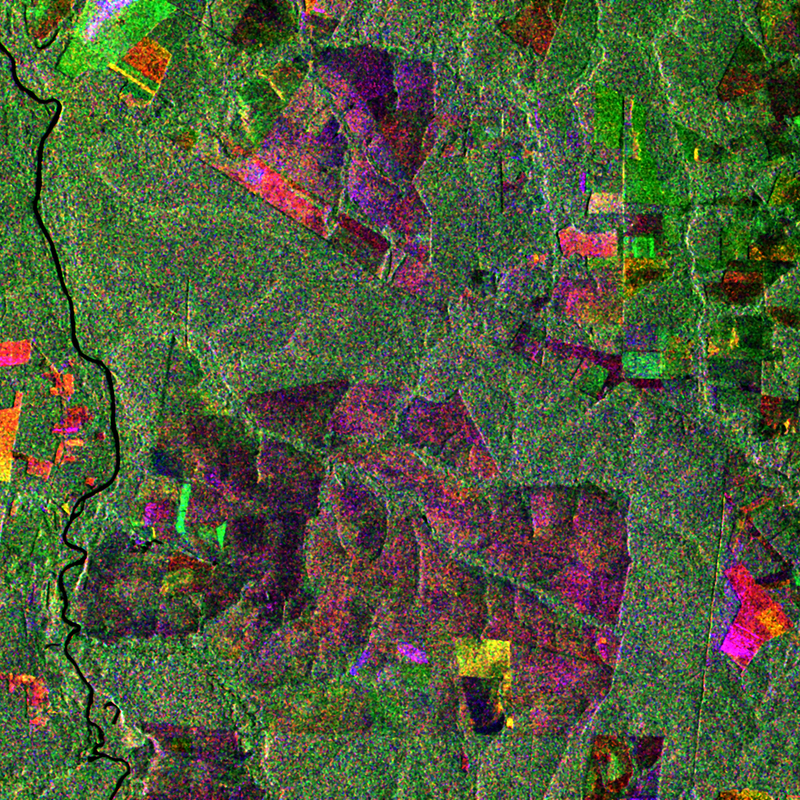 Satellite images can help in the observation of the process of sustainable cultivation and in the identification of illegal land use, deforestation, and slash and burn methods. 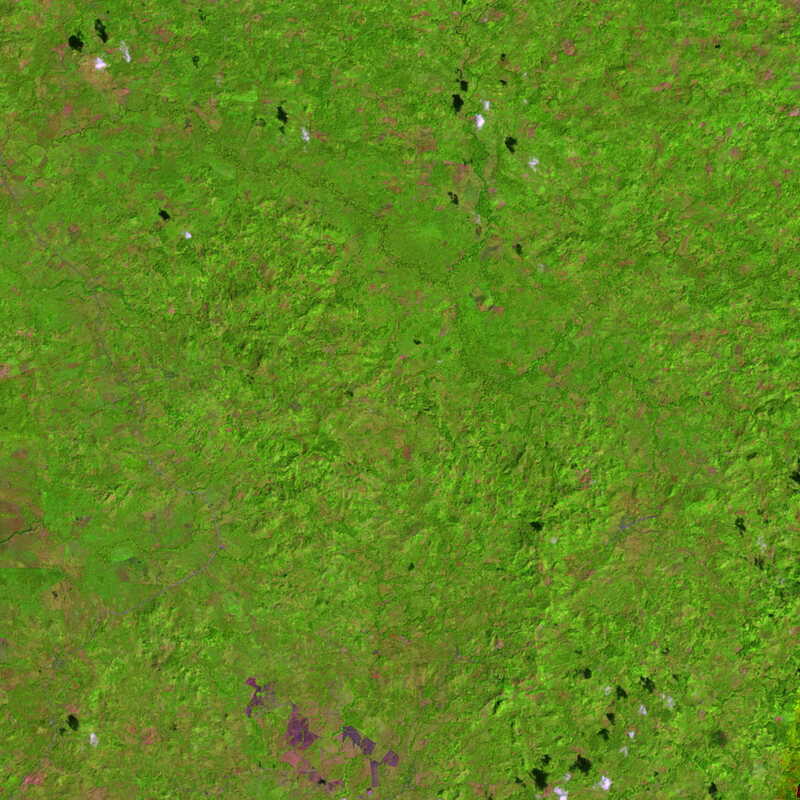 Satellite images can be used for locating environmentally acceptable routes for the transport of legal logging, or areas suitable for afforestation or cultivation. 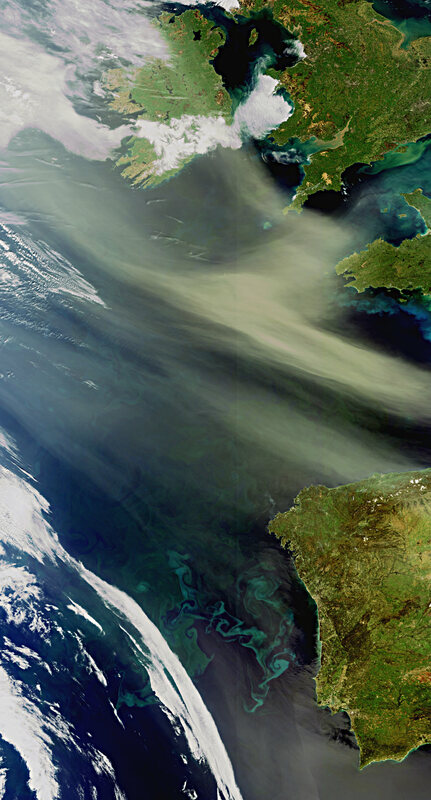 Dust and sand from the Algerian Sahara Desert, blowing west across the Atlantic Ocean. 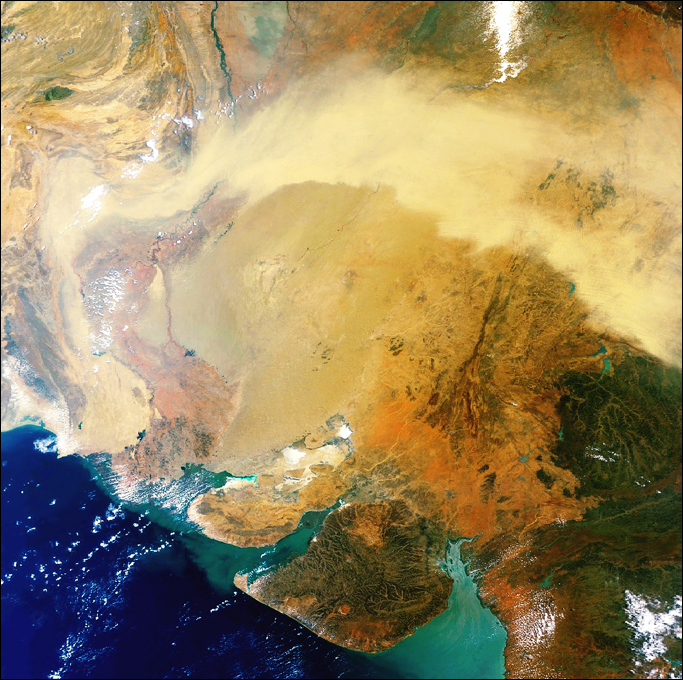 Sandstorms are very common over the Sahara, and large concentrations of the dust can be found as far as the Caribbean. The dust contains many nutrients, including nitrogen, phosphorus and iron, which act as a fertiliser and stimulate the production of massive plankton blooms. 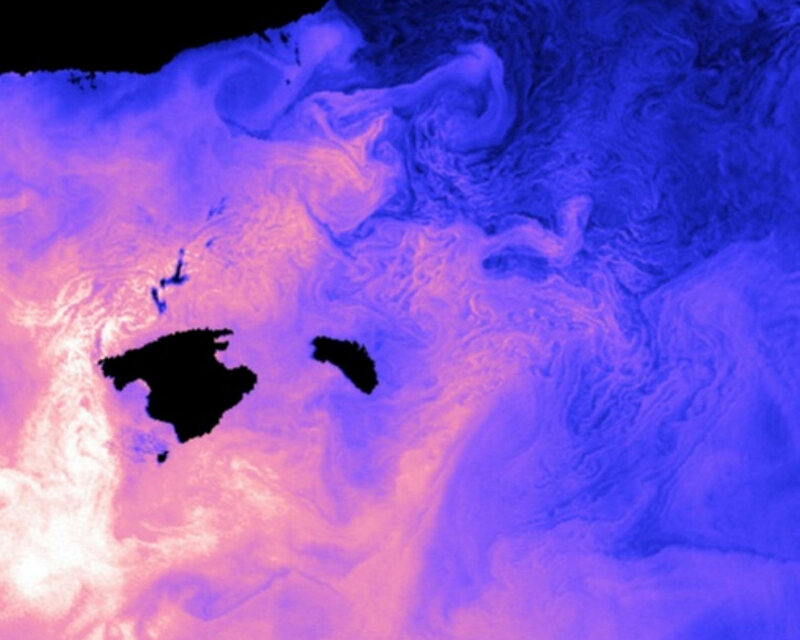 In this image, plankton blooms are visible in the Atlantic as blue and green swirls. Special 'ocean colour' sensors on board satellites helps track algal blooms. This image was captured by the Medium Resolution Imaging Spectrometer (MERIS) on board Envisat. 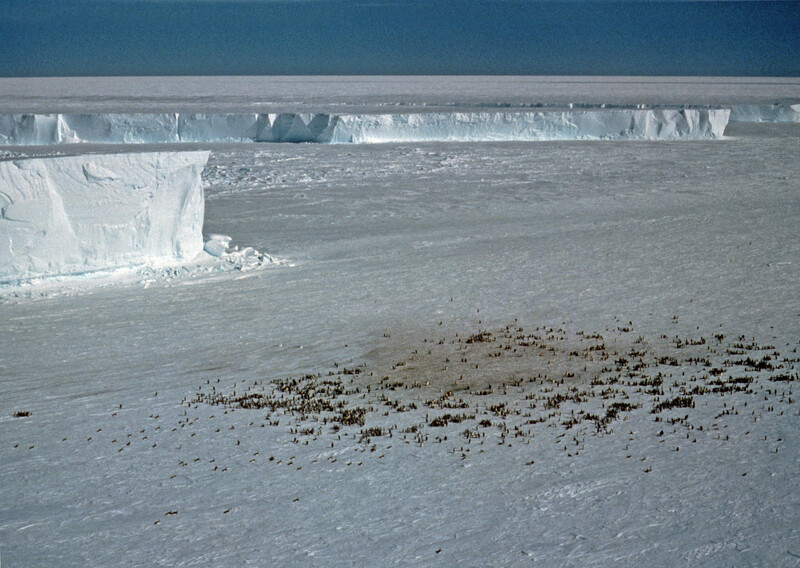 This image shows Antarctic ice stained brown by Penguin guano (penguin poo). Satellite mapping of penguin guano is a new technique researchers are using to work out where penguins are on the continent so their breeding grounds can be mapped and their numbers calculated. Using this method of analysing satellite images, researchers have found 38 colonies on Antarctica – 4 more than were previously thought to exist. The technique can only detect colonies of more than 500 pairs of Emperor Penguins. 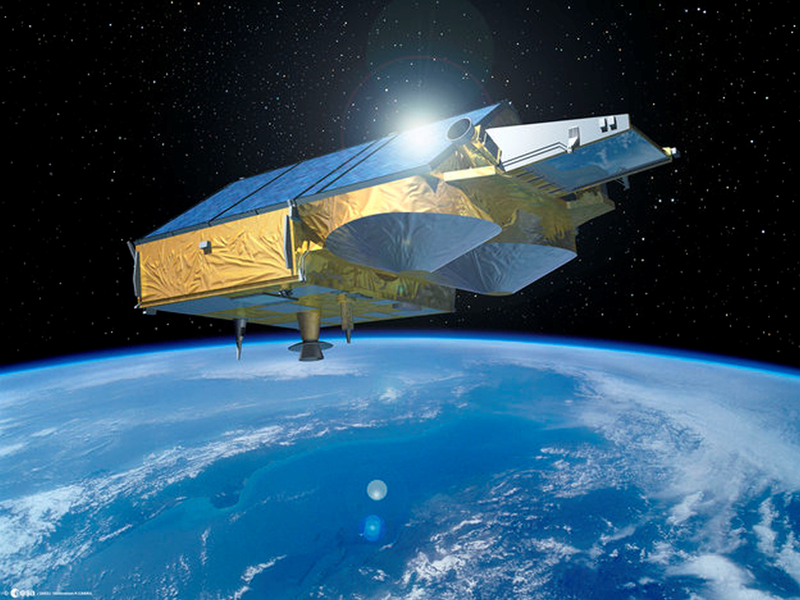 Cryosat-2 was launched in 2010 to measure the thickness at the margins of Greenland and Antarctica and to measure the thickness of marine ice floating in the oceans nearby. On February 13th, 2013 an international team of scientists used new measurements from ESA’s ice mission and discovered that the volume of Arctic sea ice has declined by 36% during autumn and 9% during winter between 2003 and 2012. 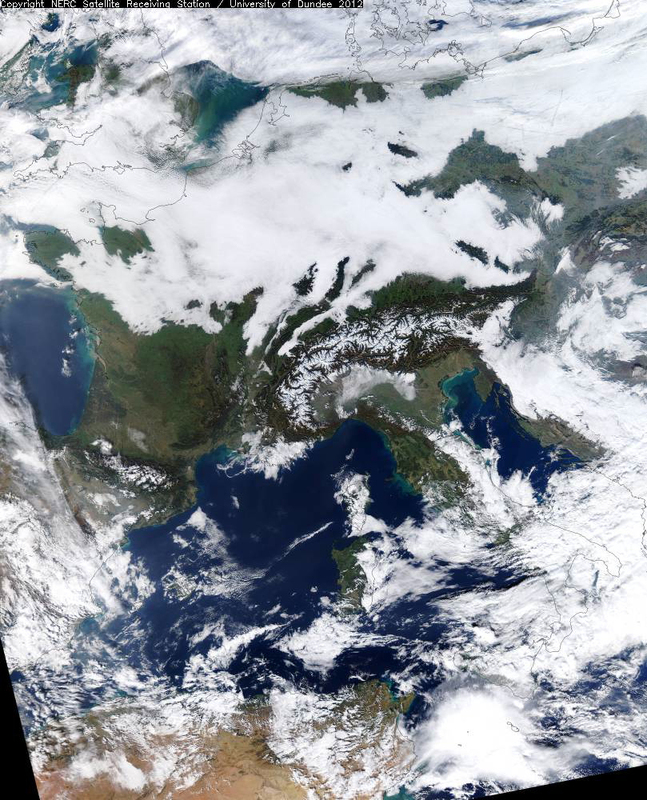 In this image fog and low cloud is visible over a large swathe of Europe. The Alps are predominantly cloud free and snow covered. A thunderstorm can be seen over the Mediterranean Sea off the east coast of Tunisia. 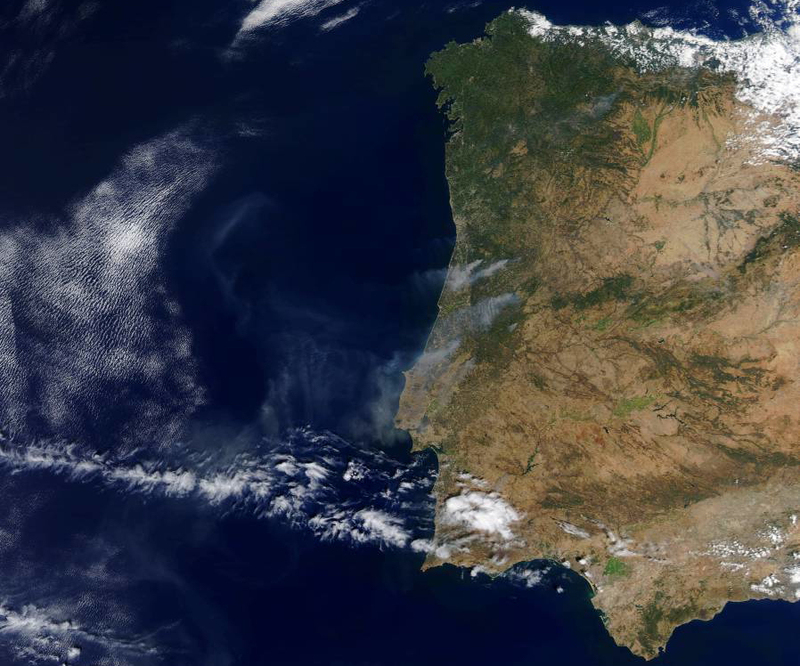 Forest fires along the coast of Portugal; smoke can be seen billowing out into the Atlantic Ocean. Being able to monitor forest fires is very important to help tackle them and ensure people are kept safe. Satellites are crucial to this kind of monitoring which allows the exact point where a fire started to be identified, and also enables researchers to monitor carbon levels. 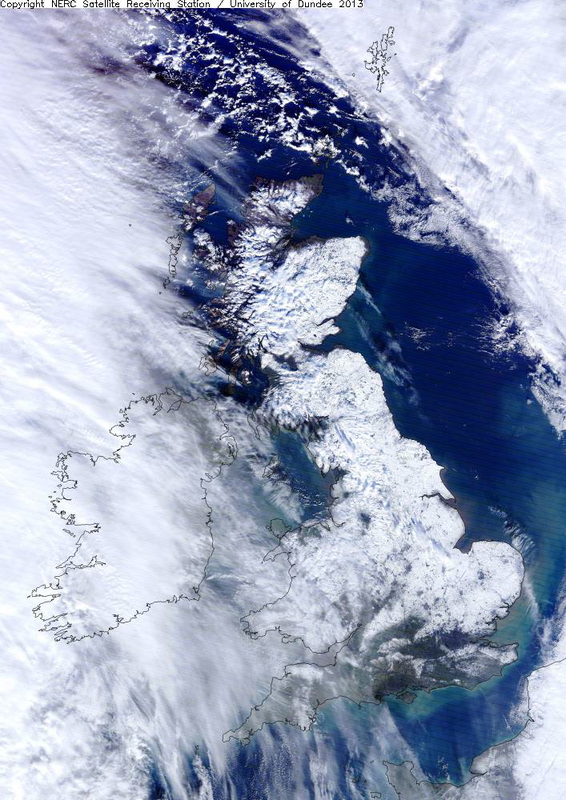 The British Isles are cloud free in this image from March 2012 when we had a very dry spring. 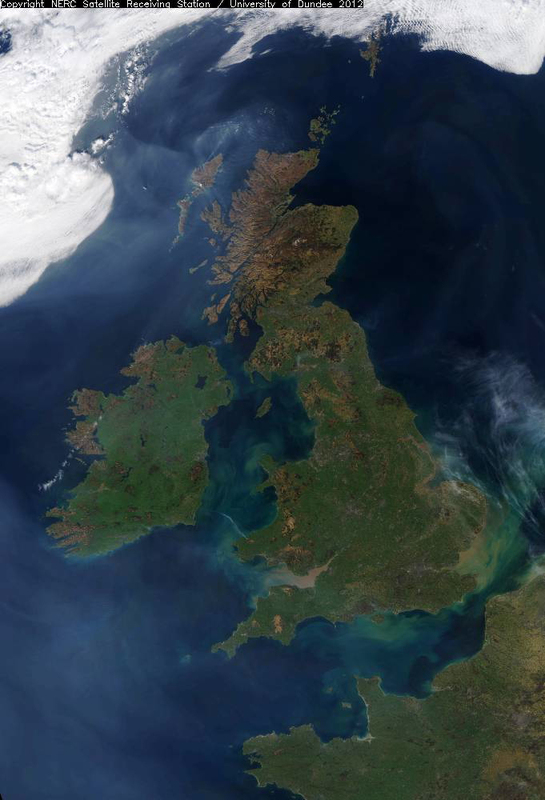 Smoke plumes from moorland and forest fires can be seen across the United Kingdom and Ireland. The fires in Dumfries and Galloway, Pembrokeshire and on the Isle of Lewis most apparent. 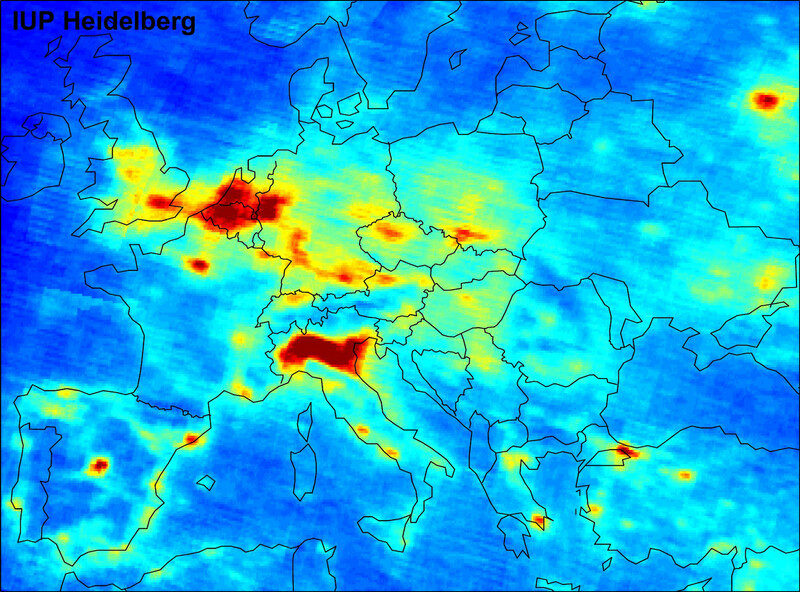 This image shows ‘hotspots’ of pollution across Europe. You can easily work out where some major cities are based on the pollution levels in that vicinity. Areas of high pollution are shown in deep red, orange and yellow. These are results from the Global Ozone Monitoring Experiment-2 (GOME-2)- this measures Nitrogen Dioxide levels in the atmosphere. While NO2 in the troposphere layer of the atmosphere is split by sunlight to form ozone, however at lower levels of the atmosphere certain reactions mean acid rain is more likely to result from its presence. 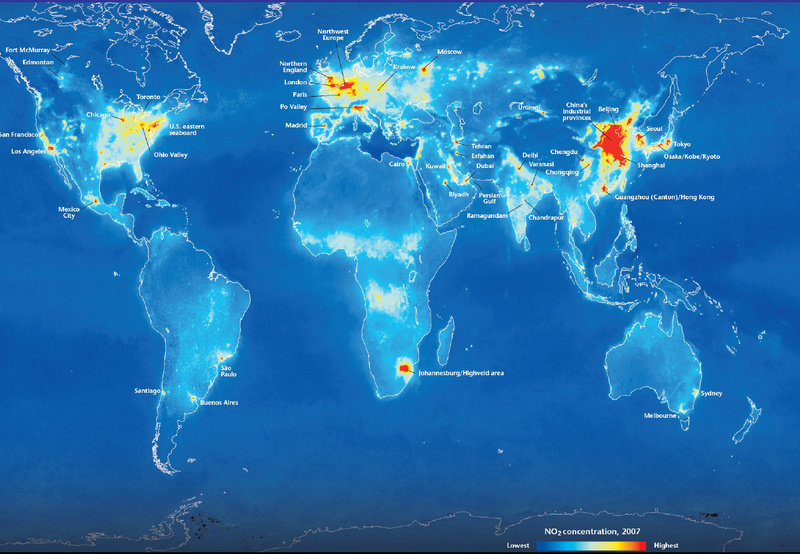 This image shows hotspots of pollution across the entire globe. This image shows global levels of NO2 – comparing with the previous image of pollution across the globe shows that the pollution and NO2 levels are seen in the same places: in the areas of large cities. 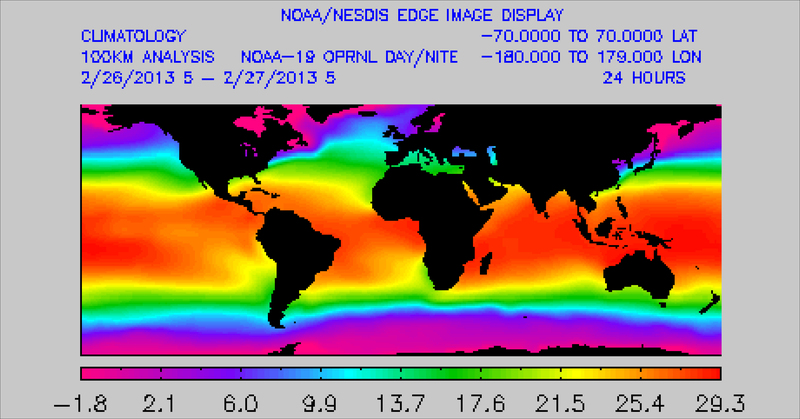 Sea surface temperatures (SST) have been monitored by satellites for over 40 years. Satellites provide a more complete picture of temperatures than just taking measurements from ships. It’s important to understand sea surface temperatures, the different variables that can affect them and also what they affect. SST data is fed into atmospheric models as it has an impact on the atmosphere above – for example the formation of sea fog and tropical cyclones. Corals are vulnerable to bleaching when the Sea surface temperatures exceed the temperatures normally experienced in the hottest month during the year. These maps highlight regions where this is happening. 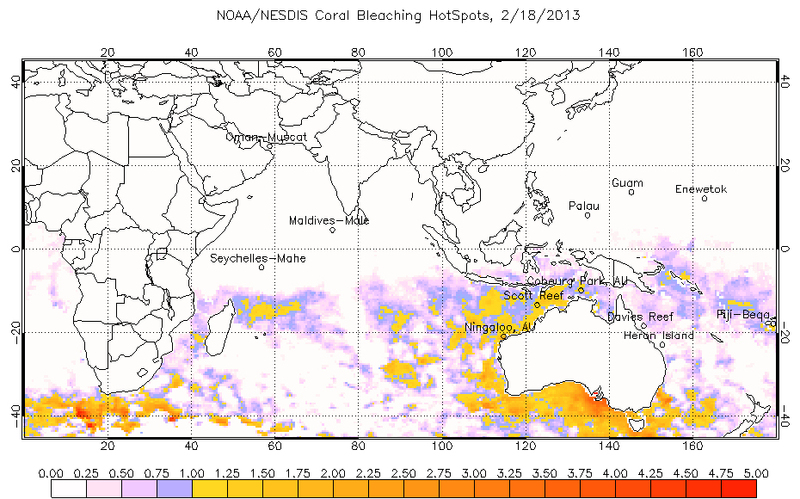 The HotSpot value of 1.0 °C is a threshold for thermal stress and can lead to coral bleaching. In these images HotSpot values below 1.0 °C are shown in purple and HotSpots of 1.0 °C or greater range from yellow to red. Oil spills from ships or oil rigs can harm marine wildlife and pollute the seas. 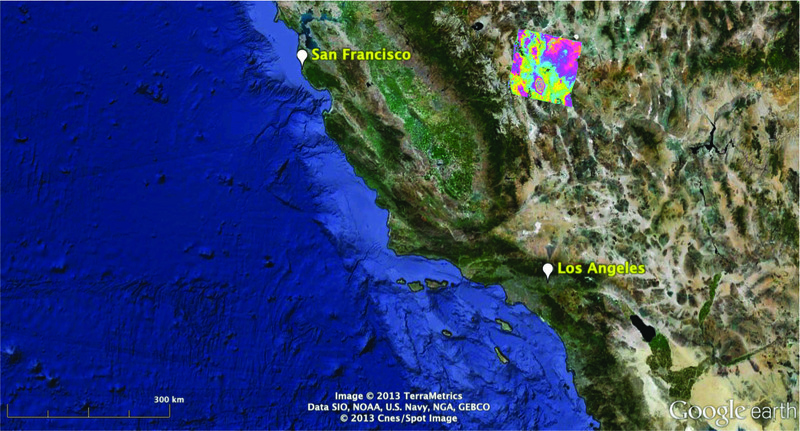 We can detect and track oil spills using satellites. Radar reflects differently from rough water than it does from smoother water. Oil smooth ocean waves showing up as a green patch in this image of Northern Spain. The darker green shows the full extent of the pollution in December 1992. The lighter green shows what was left a few weeks later in January 1993. Using this information we can manage the damage and try to predict how the pollution will spread. In 2010 a major oil spill spread across the Gulf of Mexico when the Deepwater Horizon drilling rig exploded and sank off the coasts of Louisiana and Mississippi. The image on the right is a view of the spill from Envisat in visible light. The oil spill shows up as a white swirl on the right. 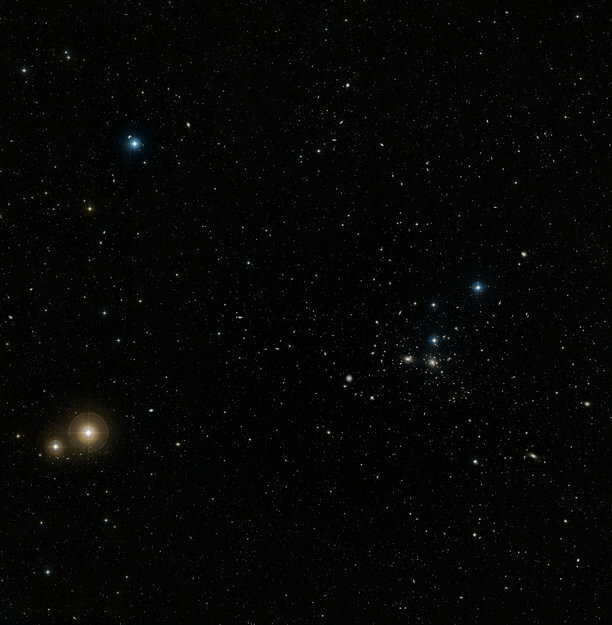 A band of cloud can be seen drifting up from the bottom right corner. Using another instrument on Envisat we can see through this cloud. The image on the right was captured using radar which allows us to see through cloud and at night because it doesn’t use light from the sun. The oil spill in this image shows up as a dark grey whirl in the bottom right. Arctic sea ice concentration (September) from 1978 to 2010. 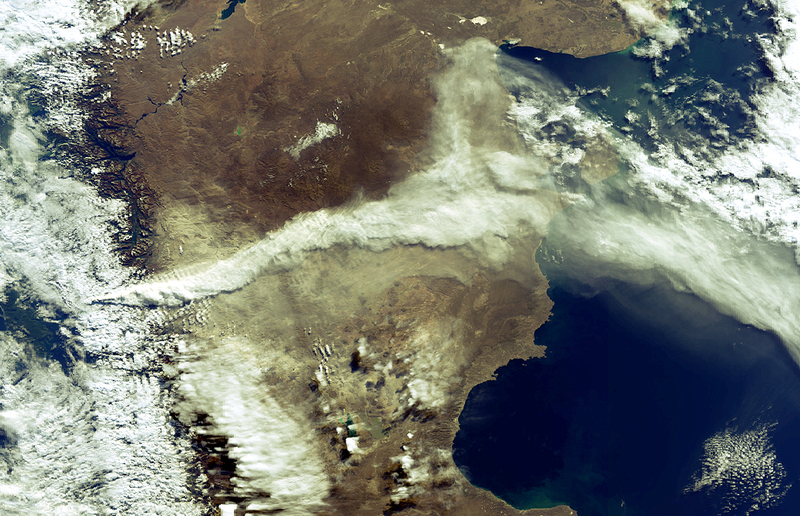 In this image ash from Chaiten Volcano in Chile can be seen being ejected into the atmosphere.